Last week’s total included 1600 words I’d written on Wandering Wizards, but this week’s total is all NaNo words. For those of you keeping track, I’m about 3,000 words behind at this point, which really isn’t bad. While I have every confidence I’ll be able to catch up, I’m not going to stress about it if I don’t. I’m very close to being able to work at my new desk in my reclaimed office. There’s still several boxes scattered around, but they’re mostly empty. Well, except for the stack in the corner that’s waiting for a trip to one of the thrift stores. One of the most time-consuming parts of working in the office last week was trying to figure out what stuff goes in what drawer of the desk. If I thought figuring out what files to keep close was bad, it was nothing compared to all my little stuff - pens, paperclips, knick knacks, markers, USB keys, and all the other myriad things I kept in my desk drawers and the upper drawers in my filing cabinets. Which reminds me...I think I’m still missing a box of “stuff” that needs to be relocated. Specifically, the stuff that was in the bottom drawer of my other desk - a bunch of fancy notebooks and stacks of CDs and DVDs. And didn’t I have a small first aid kit in one of the drawers? Nuts! Guess I’d better take another look around. Despite ending up with more drawer space, it was still hard to decide what should go in what drawer. Two of the drawers have lift out inserts - one that’s easy to get at, one a little more difficult. So then there was the question of what should go in the upper part and what goes in the lower. And you want to be logical about it so you can find stuff again. So...which do you think I’ll finish first? My NaNo novel or the Great Office Shuffle? 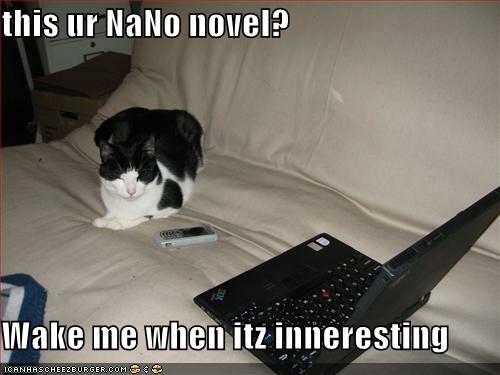 Carol, I think that the NaNo novel will be completed before the Great Office Shuffle. Of course, some knitting, bread baking, backpacking and a course in Auto Mechanics may be completed before the NaNo novel is. Just a thought from someone who understands. You know, really, really understands. Good luck with both my friend!